Saturday, June 15, 2013 from 11 a.m. until 3 p.m. 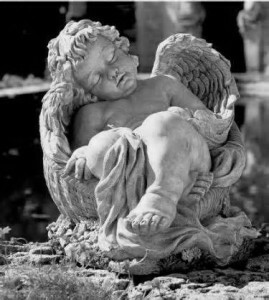 This sleeping cherub concrete statue has been generously donated by the Guardian Angels, the not-for-profit organization overseeing the Beecher Mausoleum restoration project. It will be raffled off to a lucky ticket-holder at Beecher’s July 4th celebration. Winner need not be present to win. Tickets were available at the Township Center, Village Hall, Hack Funeral Home, First Community Bank, and on June 15th at Fireman’s park and at the mausoleum during Drivin’ the Dixie. Caution drivers: Horner Lane aka: St. Luke’s Cemetery Drive is a gravel road. Go slowly! Dr. Miley read the instruction carefully and produced his car; however, he missed one important instruction. The chain that propelled the vehicle was installed backwards and, when the doctor started the car, it would only go in reverse. Fritz Hinze, the town constable, told him: “You can’t go backing around Beecher. That’s against the law. Don’t see why you bought one of them new-fangled things. They will never be accepted by the people.��? The doctor re-read the instructions and put the chain in correctly… spinning around town at three miles per hour.